Quick: What's the most effective method your church uses to move people through the discipleship process? In other words, how do you get new visitors to join? And once they've joined, how do you get members engaged in the life of the church? Verbal announcements? Bulletins? Smoke signals? Begging? Pleading? What if I told you one of the most effective ways to move church members through your discipleship process was with your website? Would you believe me? 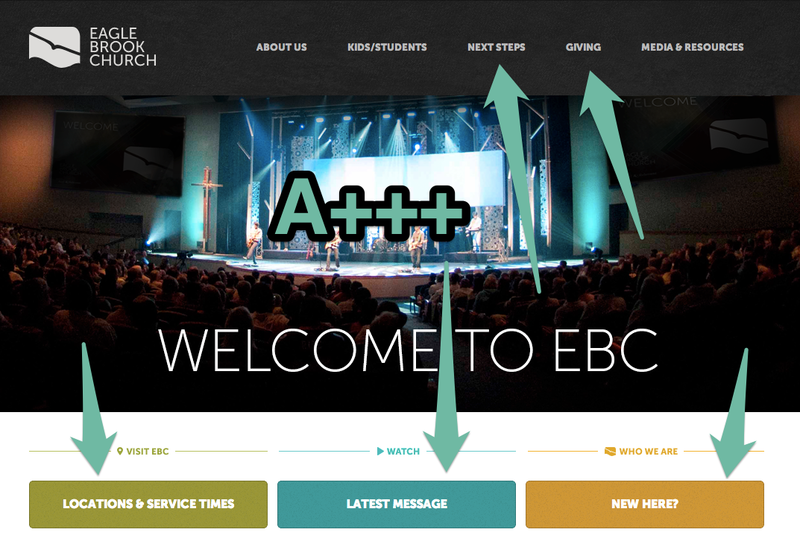 Anticipating some skepticism, here are three examples of churches who clearly communicate the discipleship process with their website. One of the most helpful items on Highland Park's website is the STARTINGPOINT button at the bottom of their image rotators. It captures the homepage traffic magic and places a highly-visible call-to-action where people are most likely to see it. When people click, it communicates there is more to being a member of Highland Park than simply attending on Sundays. This last sentence moves new visitors and regular attenders into a deeper relationship with the church by suggesting membership. Brilliant. Eagle Brook is one of those rare churches that gets simplicity. Simple does not mean simplistic. In fact, the exact opposite is often true. Simple website design and information architecture is incredibly complex. It takes time, effort, thinking, pruning, and constantly asking the question, "does this need to go here?" New visitors: Locations and service times, plus a dedicated "I'm New" section to ensure people coming for the first time know what to expect. Regular attenders: The "Next Steps" section is specifically for people who want to grow in their commitment to the church community. Appropriately named and no doubt creates movement along the mission process. Active members: The "Giving" tab allows members to easily give with just three clicks. (Our research shows members who attend the church longer are more likely to give regularly online.) The "Latest Message" page is also targeted towards active members. Mature disciples: For the full-fledged disciple-makers of Eagle Brook, we go back to the "Next Steps" section. Mature disciples can search for opportunities where they can serve, both locally and globally. The Eagle Brook home page works because it communicates something to every persona within the church. The beautifully-designed website of Port City Church clearly communicates it's a church whose desire is to be known. Much like Eagle Brook's website, Port City communicates to each persona in the mission process design continuum. Active members can easily join a small group by registering for MYPC3, the online portal for church members. MYPC3 is the place where "you can search for a Small Group, stay in touch with other volunteers and/or your small group through group calendars and communications, donate online or view your giving statement." Mature disciples can pick from the opportunities listed in MYPC3 or from the long list of volunteer opportunities at Port City. Even though these churches serve different populations and communities, they all share one thing in common: movement. 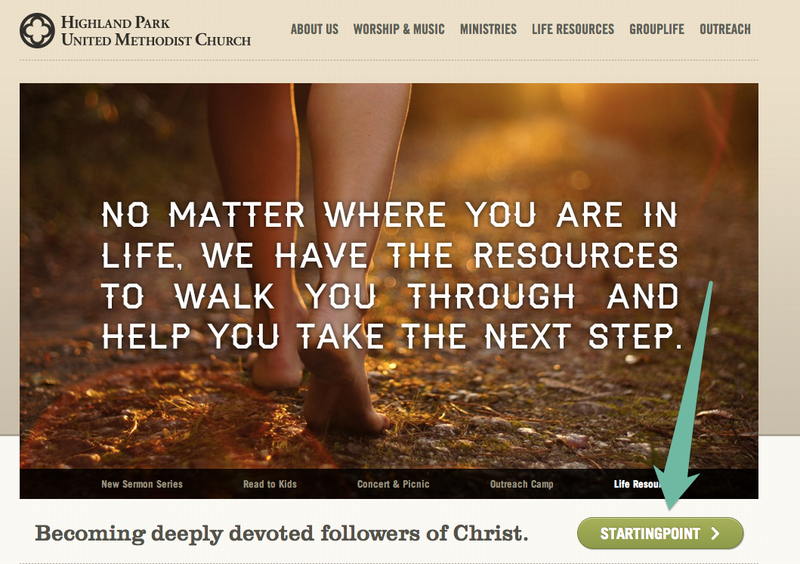 The home page clearly communicates to the various groups within the church, while maintaining a crystal-clear focus on the mission. That, dear readers, is a hard thing to do.